Tons of calculators about calorie consumption and ideal weight. Is our specialty. 2 Diary Styles: The usual Daily Diary where every day is a separate page, and Scroll Diary where one sees all days together. First class service, full personal attention. We can afford one-to-one communication with all our users. Diet Interviews. Good questions, carefully thought of answers. Please select gender, age and height. 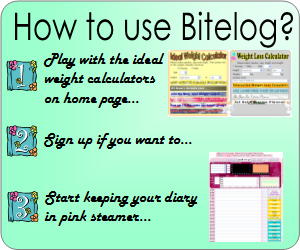 Then press one of the weight calculator buttons. Please select gender, age, height and weight.